For me, this image sums up my 2012 and points to a beacon of light for 2013. Last year was quite a challenge for my wife Valerie and me – not the year that we had envisaged in January. A straight forward looking year turned into one of unplanned trips and a crippling accident which entailed several long periods away from home. The above image was taken at Cape Palliser near the entrance to Wellington Harbour. We visited this remote cape as a side trip before journeying to a family wedding. When I look at the stairs they represent the long haul through the year where out-of-town family child minding trips dominated the early part, followed by Valerie’s recovery from a skiing accident in the latter part. The lighthouse at the top represents the beacon showing a clear passage for the year to come. In between all of this we fitted a whale watching trip to Kaikoura on the north eastern coast of the South Island of New Zealand, a holiday on Queensland’s Gold Coast, and a lovely couple of days skiing before the accident. We are grateful that our wide circle of friends have given us encouragement and support throughout the period since August, for which we feel blessed indeed. Such is Val’s recovery that we are already planning our travels for this year and are excited by the prospects of what is to come. The stairs also represent my journey with photography and blogging. It has been a year of learning and experimentation. Each new discovery leads me towards the next summit. My blog received its 10,000th visit just before New Year’s Eve, which was one of my goals for the year. I don’t do this for the numbers but, being a retired numbers person, I am interested to watch how the visits increase and where they come from. This blog gives me an outlet for my photography and a reason to keep on finding new material and to improve my craft. I am grateful for those who take the time to visit and explore my blog, and especially for the growing number of followers. In return I follow the blogs of others and get great enjoyment from reading what they post and how they see the world. Thank you for your support. Best wishes for 2013, and may you succeed in all you do and have a happy and healthy year. This entry was posted on January 3, 2013 by alphathread. 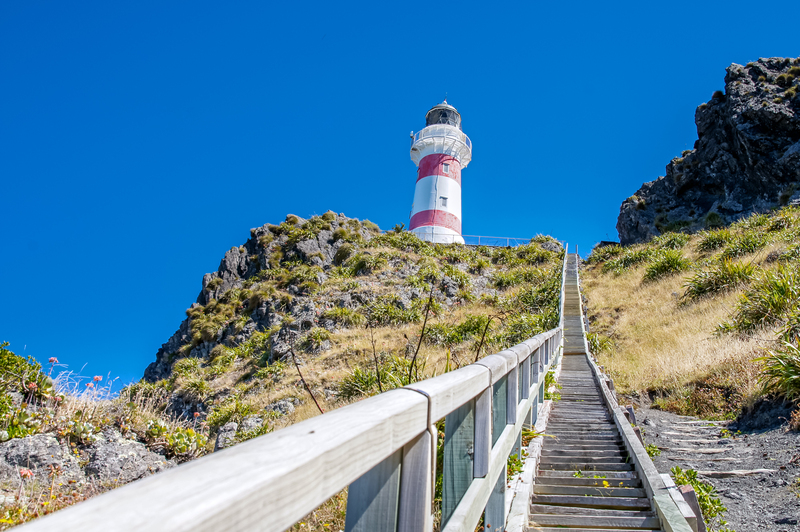 It was filed under Chris Gregory, Exploration, New Zealand, People, Photography, Random Thoughts, Weekly Photo Challenge and was tagged with beacon, blog, blogging, Cape Palliser, hope, Lighthouse, summit, Wellington. Wonderful post! I’m excited for your future. Sounds like you made it thru a difficult year. Best wishes for smooth sailing in 2013! Congrats on your 10,000!! !